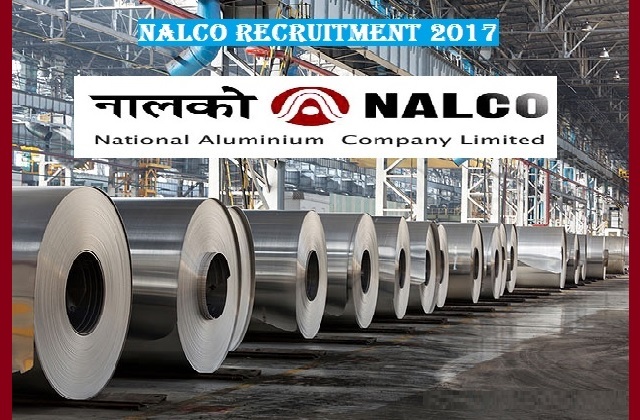 NALCO-National Aluminium Company Limited Recruitment 2017-2018 Application Form, 09 Laboratory Assistant, Junior Accountant Gr.II, Assistant Gr.III (M0 grade), Pharmacist, Laboratory Technician Gr.III (Pathology) (P0 grade) Posts Download Application through Official website www.nalcoindia.com. The last date for submission of applications is 15.01.2018. NALCO Recruitment Notification 2017-2018 Apply Now. pattern of examination, NALCO Syllabus, Exam Date, NALCO Result Date etc. Laboratory Assistant - Candidates should have passed B.Sc (Hons.) in Chemistry with one year of relevant service experience in reputed Chemical/Metallurgical Industries. Laboratory Technician Gr III (Pathology) (P0 grade) - Matric/ Higher Secondary / 10+2 in Science with Diploma of minimum two years duration in Laboratory Technician from a Govt. College/ recognized Institution with one year of relevant post qualification service experience in a Govt. Hospital, PSU or a reputed Private Hospital. He/ She is required to perform all routine works in clinical laboratory such as Hematology, Clinical Pathology, Histopathology, Cytology, Microbiology, Biochemistry, Blood Bank works, draw blood for investigations etc, prepare necessary slides and should have proper knowledge for storage of the specimens and tissues. (iv) Caste and attested copies of relevant documents should be addressed to “Jr.Manager (HRD), Recruitment Cell, HRD Department, S&P Complex, National Aluminium Company Limited, NALCO NAGAR, Angul-759145” by post so as to reach us by 15.01.2018.